What does this have to do with donuts? Nothing - but I wanted to share a couple photos I took the other day. I had picked up some donuts for dh and myself at Tim Hortons and had the box sitting on the kitchen table. Big mistake! You remember Dexter, right? Well, here is what happened to my donut! Animals! You gotta love 'em, right?! LOL - Well, this photo is a bit of a tease, isn't it? You can't tell much from this other than that I got them done! This is the second year I have sent ATCs in for the Embroidery Association of Canada's annual swap. It is so much fun receiving ones back from all over the country that I didn't mind burning a little midnight oil to meet the deadline. All seven are in a series I called "Crazy Bits" - because that is actually what they are - bits of crazy quilting. I had a round robin block I did not know what to do with. The individual elements of the block were wonderful but somehow it didn't seem to mesh into a cohesive whole. (This is the difficulty I most often encounter in my crazy quilting) So, I sacrificed the block and used them for ATCs. I am glad I did because it gave all the individual bits of stitching a chance to shine on their own. This first one featured my favourite seam treatment from the block with staggered chain stitch scallops. Number 2 in the series had wonderful silk ribbon embroidery sunflowers and a sweet little bird charm. The third one had more of the sunflowers and a bit more of the feather stitch seam treatment with the beads. I love the flower beads on the edge of the scalloped seam treatment. How could you not love this large swan charm gliding across the waves? I also just loved the silk ribbon catstails. This mass of flowers doesn't need any further explanation - a blaze of colour in this garden! This part of the block was much more elegant and serene than the rest and I love the way it gets a chance to shine on its own now. Last, but certainly not least, a lovely embroidered "K" for Kerry, framed in silk ribbon roses. I don't think this is a cheat, cannibalizing a block to create a series of Artist Trading Cards. What do you think? I am loving the theme of this Tea Time DYB Round Robin I am in at CQI! This is the block I did for Cathy L. I was slow as molasses because I started with the teapot using cross stitch on waste canvas and about a third of the way through the dog ate my glasses as I mentioned in a previous post. So, finishing the tea pot was a challenge and a half! lol But it got done and the rest of the block came together quickly after that. I used the corner of a ladies' hankie with a tatted edging to make a tablecloth to place the tea pot and tea cup charms on. The blue and green lace is not hand dyed - I bought it as it is at a sari shop in Calgary. I used gold thread to outline the tea pot and tea cup printed on the fabric using stem stitch. The different stitched seam treatments were mostly done in DMC cotton floss. This tiny crochet hat was perfect for this theme! I was gifted with it some time ago and had been holding onto it. That`s silly though - like saving the good china and then your kids will put it in a garage sale when you are gone! So, time to use these little treasures! Here is a closeup of the tea pot that drove me so crazy. I just love making little cross stitch motifs and have such a library of them from my cross stitch days. The blocks are on their way to Lorrie now for her to work her magic. I hope Cathy will like what I have done. You remember Dexter, right? He's the cute little armful of fuzz that arrived at our house at Christmas? Well, he has gained five pounds a week since then and now he is teething. Hard to stay mad at him though. The other reason I haven't been around much is that I'm suffering through a bout of depression since before the Christmas holidays. No fun for sure but this too will pass. In the meantime I am just muddling through and trying to accomplish as much as I can. If you are interested in learning more about depression and its effects, check out Kitty & Me - Pam Kellogg has written very well on the subject and she is such a sweetheart to share her personal experiences in such a public way. When one person speaks out openly it makes it easier for everyone. Although I have had trouble doing much creative, or am doing it at a snails pace when I do, I am enjoying the kind of grunt work where you have a tangible result in the end. This is the current project. I found this at the thrift store. There were two dressers side by side, both painted in this grey colour and with labels on the drawers indicating they had been used in someone's sewing room. The other one was a triple dresser that just screamed "Three rooms of furniture for $300.00!" LOL This one caught my eye though. It is solidly built and the drawers are dovetailed, not stapled. There is also some neat detailing on the drawers and the bottom of the dresser. I have already stripped the paint off the drawers with the details so I won't show you that - don't want to spoil my little surprise! You can see a bit at the bottom though. Once I got through the grey paint... and the yellow paint... and the white paint... and got started on the varnish and stain, I called dh and got him to cast his carpenter`s eye on the wood underneath. He has tentatively proclaimed it Brazillian mahogany so that was all I needed to hear to want to keep going. When I have the job all done, I`ll share the results with you. Keep in mind though that I am not the carpenter in this family! Sorry for the long delay in getting another BAS (Build a Seam) Challenge Stitch up! As they say, life got in the way. However, without further ado, this week's stitch is the Double Detached Chain Stitch, or Double Lazy Daisy Stitch. To see the completed stitch, you can skip down to the bottom of this post, after the tutorial I`ve included here on how to do the stitch. Begin by making a regular detached chain stitch - you can find a great tutorial for the basic stitch at Sharon B`s dictionary of stitches here). Once you have made your detached chain stitch, make another detached chain stitch on the outside of it. To do this, ring your needle up a little above where you came up to start the first stitch. Take it down again right next to that spot and bring the point up at the end of the catch stitch from the basic stitch. Make sure your thread is under your needle point before pulling the needle through to create the loop which should lay around the outside of the first stitch. Make a catch stitch (a small straight stitch that "catches" the loop thread and secures it) on the outside or second detached chain stitch. Here is the series of completed Double Detached Chain Stitches I made. Looking at it now, I wish I had used threads with more colour contrast to make it easier for you to see. I hope you can make it out though. Basically each Double Detached Chain Stitch is a single Detached Chain Stitch and then a larger one which goes around the outside of it. In my example the inner stitch is light blue and the outer stitch is purple. If you need a better example I can work one up in perle cotton - just let me know! I just bought my first AAQI quilt! Well, how exciting is this!! I just purchased my very first AAQI (Alzheimer's Art Quilt Initiative) quilt! Here it is - isn't it beautiful? I just love it! This little beauty was made by Susan Chambers of Belleville, Ontario, right here in Canada. Buying an AAQI quilt made by a fellow Canadian makes it even cooler! 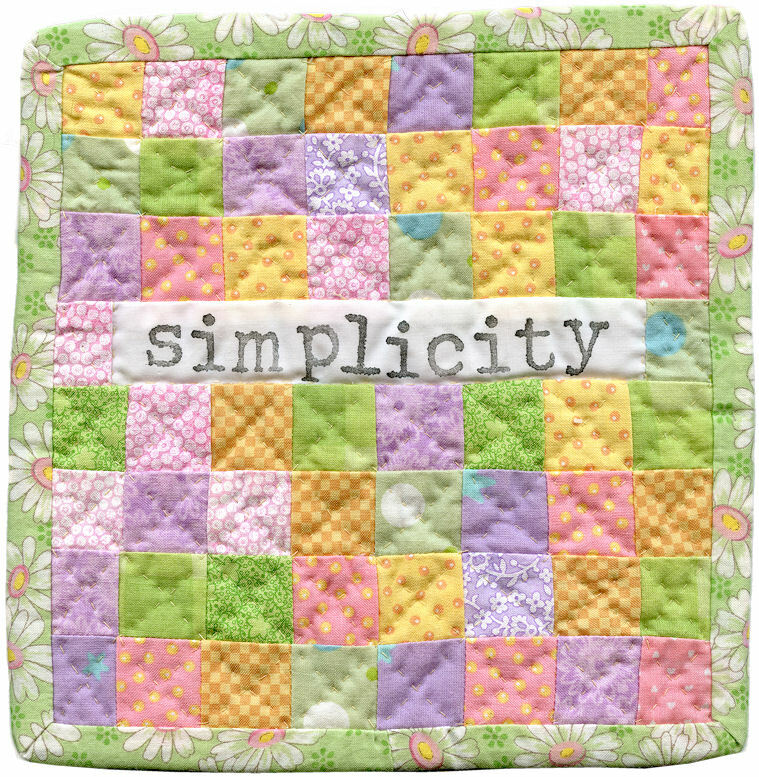 I love, love, love these colours and the word "simplicity" should really be my mantra, LOL! I really like the idea of incorporating rubber stamping into quilting. Hmmm.... wonder why I never thought of that idea on my own? I wonder if I can find a way to incorporate the technique into my crazy quilting? I'll have to ponder that one and see what I come up with. For a little more information on my new treasure, you can check it out on the AAQI website here. If you are wishing you had seen it first (how could you not? lol), you can check out the other quilts for sale here and find a treasure of your own. Go on.... you know you want to! Not only will you be happy to have one for yourself, you will feel so warm and fuzzy inside for having bought one - ask me how I know? Now I am thinking of all the people who would love one as a gift - my favourite old hippy doctor who goes so far above and beyond what the health care system pays her for, a nurse who has made things so much easier for a loved one... So many people affected by Alzheimers and other forms of dementia would appreciate an AAQI quilt way more than a bouquet of flowers or chocolates or whatever unimaginative gift I had thought of buying for them. Well, I am all excited about my new quilt (can you tell?) so just had to share! Do you deserve a treat? How about six days and five nights in the mountains at Estes Park, Colorado, sharing a large private cabin with other crazy quilters at the best retreat ever? Well, why not join us for our fourth annual Crazy Quilting International gathering, SEPTEMBER STITCH SHENANIGANS!! 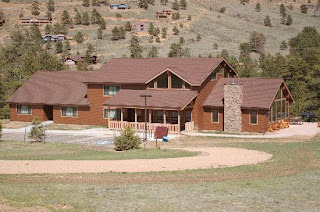 Approximate costs are $255 for lodging, $100 to cover teachers and, of course, your own funds for shopping and meals. You can't beat a deal like this!! For more information, check out the Crazy Quilting International blog! I'll be there and I can't wait to meet more stitchers from all over! I have just finished getting my donation ready for this year's auction for the Brant Christian School located next door to me. I like to support the school since we are neighbours. My donation this year is a counted cross stitch picture (Isa. 58-11). I didn't actually do the stitching - it was a piece I discovered at the thrift store. I bought it because it was lovely stitching in an awful frame. I wish now I had taken a before picture prior to reframing it. I substituted the original mat which was a plain green square with this mottled green suede-like matt with a bit more interesting cut in the corners. The frame was originally a green and black plastic of some type. I bought a can of gold metallic spray paint which was guaranteed to adher to any surface. The paint worked wonderfully on the frame and gave it a much richer look. I am quite pleased with the finished effect - simple but elegant and the framing now shows the stitching up to its best advantage. So, this will go to the school for their annual auction and I hope it raises a few dollars for them. Well, there is another challenge going on at AAQI that I just can't resist! 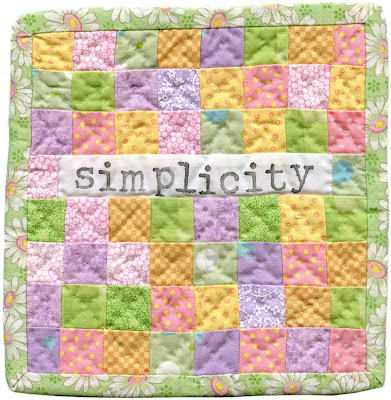 It is called the Quilt a Month Club and you can check out all the details here. In a nutshell, the challenge is to either make or buy a AAQI quilt every month for six months. So, you can make one and donate it or, if you do not manage to get one done, you can buy one instead and stay in the challenge that way! Win-win situation if you ask me! Happy Valentines Day! 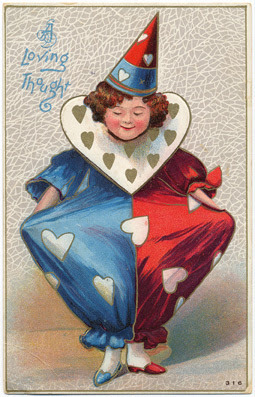 Here is a vintage Valentine to warm your heart on this cool February day! What have you done to celebrate St. Valentines Day? At my house we decorated with all our various heart shaped trinkets like this red straw heart wreath. I made a special supper which included chocolate cupcakes with butter frosting and these handmade chocolate hearts I whipped up this afternoon. Get yourself a box of tissues, a big bowl of popcorn, your sweetie and snuggle! My Pansy themed DYB RR blocks arrived home awhile ago but I don't think I posted pictures of them yet. I loved this theme to work on and the end results of the blocks were wonderful. This first one was the group block, so all five of the other stitchers in the round robin had a hand in this one. Such gorgeous seams and I just love the silk ribbon jumping jacks. Cathy did this one. These crochet pansies are my daughters favourite thing from all the blocks. I love the fact that Cathy made me one of the three dimensional butterflies I enjoy making so much. This one is Arlene's work. She makes these great ribbon pansies! I really enjoy looking at all the little details Arlene added to this block. There is another of the large ribbon pansies gracing this block embellished by Lisa - aren't the colours of the ribbon pansy wonderful? More beautiful silk ribbon jumping jacks as well as violets on this one. Alice did this block and added a silkie from one of Carolyn Phillip's watercolours. If you check out Carolyn's blog you can find a series of these she is sharing for free. How wonderful it must be to have talent in so many artistic directions as Carolyn does! Alice surrounded the silkie with a tatted edging and added a wonderful little pink lace butterfly to the side - gorgeous! This block was embellished by Carolyn. The photo doesn't really do justice to the wonderful pansy she made from velvet - it is just to die for. Carolyn does such beautiful seamwork too - always an inspiration! So there you have my Pansy blocks, embellished by all these wonderful stitching ladies. I feel very lucky to have their beautiful work in my hands. Now, what to make from these great blocks? Look at the lovely sparkly that I found in my mailbox on Friday! This beautiful beaded bauble is from Marie of SRE Deluxe. I entered a giveaway on her blog as she was celebrating her third blogiversary and this is what she sent me. I love it! I have just mailed Ritva's Under the Sea themed DYB blocks on in the Round Robin rotation and thought I would share a photo of the one I did for her. The seabed is made from fancy knitting yarns, couched down, and then I added some starfish charms. There is a small sea plant peeking out - it is an oya. The pink fernlike plant is a piece cut from a large piece of floral venice lace and dyed pink with Adirondak alcohol ink.I folded the piece into two sections in order to make two fronds for the plant and couched it down with french knots and buttonhole stitch at the end. The larger seaplant is made with feather stitch in a variagated perle cotton and there are small black metallic bugle beads added. The seashell is another piece cut from a larger lace trim and sewed down using chain stitch. I added a small pearl-like bead on it as well. On the far left is a long piece of seaplant which was an interesting sequin trim. The seams at the top are all feather stitch with detached chain stitch added to them. The stingray bead came from a shopping spree at my first CQI Retreat in Colorado and the two pink fish were a pair of earrings. My favourite things on this block are the two silk ribbon fish. They were inspired by The New Silk Ribbon Embroidery, written by Victoria Adams Brown of Ribbon Smyth. I hope that Ritva will enjoy the block. I had a lot of fun stitching it.